Supply chain management was one of the factors that helped us out of the middle ages. Where would we be today without the tools and processes to manage the flow of goods and services or the ability to utilize specialist’s skills and resources far apart from another? Chances are, we’d still be raising our own food. While I admit that I have days when I fantasize about this type of simplicity, I like my cushy life too much to give up on essentials like Starbucks coffee. Plus, my family would quickly starve if we had to rely on my farming skills. So, it is good that instead of farming and foraging, I work for a software company instead. Today, the flow of goods in the world relies heavily on bits and bytes shared among the world’s computers. Each day, software and computers control billions of dollars-worth of goods traded between countries. These goods—anything from livestock and produce to mobile phones and coffee beans—travel from farms and assembly plants to stores by truck, rail, air, and ship. Supply chains link the world’s population tightly together; all our lives depend increasingly on timely and smooth operations and careful supply chain management. Logistics centers keep the global supply chain moving. Supply chain centers around the world drive our global economy. Manufacturing and retail sectors in particular depend on the supply chain, and this trade makes up more than 18 percent of the US gross domestic product (GDP). Everything we have and own goes through the supply chain. Business interruptions can be devastating and impact our livelihood. Understanding the role supply chain management plays is critical. In this case, seeing is believing and believe me, knowing where infrastructure is located can make or break the supply chain. Logistics centers are the powerhouses of the supply chain. Two of the largest container ports in the US are located right here in Southern California, about an hour’s drive from Esri headquarters: the Port of Long Beach and the Port of Los Angeles. Not only do these ports comprise an important regional hub, they are also a big deal to the rest of the country. From here, most Asian goods get unloaded and distributed into the US supply chain. 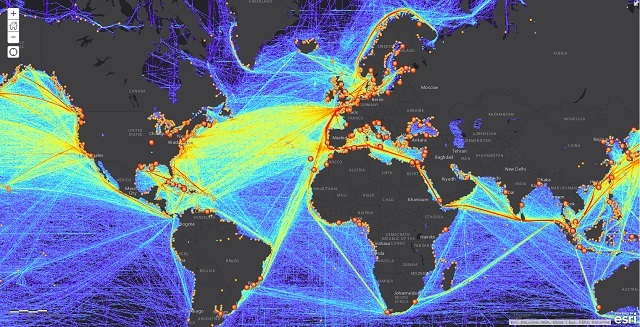 Last year 14.6 million shipping containers passed through these ports. In fact, 40 percent of all goods imported into the US last year came from these two ports, right in my backyard. Any disruption of the regional supply chain impacts the economy not only regionally but nationally and perhaps even beyond. Does a global supply chain have regional affects? Even though a majority of the goods that pass through go to other parts of the country, these ports have a huge impact on the region. The Port of Long Beach, for example, supports more than 30,000 jobs in Long Beach alone, and 316,000 jobs throughout Southern California. The ports directly serve the Inland Empire (IE), once known for being the first to burst in the housing bubble. What helped it rebound? The logistics industry. The IE handles about 75 percent of the goods that are imported through these ports. Truck drivers, inventory managers, and warehouse workers are growing the economy in the IE at a rate of one in five of all new jobs added in the area. 14.6 million shipping containers passed through the Ports of Long Beach and Los Angeles, and the Inland Empire handles approximately 75 percent of the goods that are imported through these ports. Why is this area doing so well in supply chain? It has everything to do with geography. Two major international airports are located here, along with thousands of miles of roads and highways, as well as rail lines. The higher transport costs shippers incur by driving goods 60 miles inland from the ports is offset by lower real-estate and labor costs in Riverside and San Bernardino Counties. And with land so much cheaper here than in counties to the west, such as Los Angeles and Orange, mega warehouses and distribution centers for big named big-box and online retailers including Amazon, , Best Buy, Home Depot, Nestle, Nike, Nordstrom, and Samsung, are sprouting up. 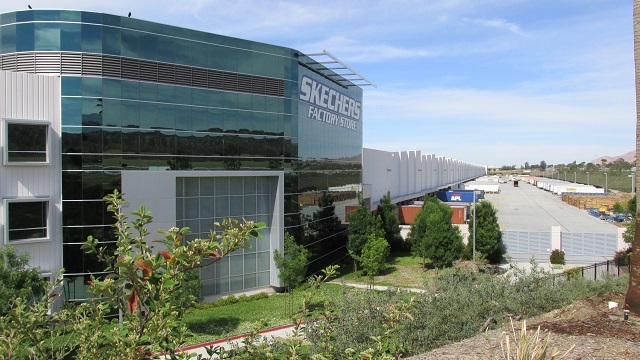 One of the U.S.’s biggest warehouses—the Sketchers Distribution center, which is 1.82 million square feet, or enough to fit more than 30 football fields—is located here in Southern California. The Sketchers Distribution center is large enough to fit more than 30 football fields. Not only has the area become a conduit for goods getting into the US supply chain network, but with e-commerce, the Inland Empire is leading the latest bricks-to clicks retail revolution. The growth in imports is happening along with a trend in retail towards larger warehouse facilities and e-commerce fulfillment centers. These days, warehouses no longer are thought of as a place to stockpile goods. A vast majority of the goods spend a week or less in warehouses and are quickly shipped to store hubs, retail stores, or directly to customers. How big is e-commerce? Americans bought more than $263 billion in goods online in 2013. That’s a lot of online retail being shipped out each day. How do we manage a sustainable supply chain? Well managed supply chains are critical for our economy. Because of the volume of shipments and risks involved (weather, natural catastrophes, political, and theft to name a few), effective supply chain management is very complex with the demand to analyze a lot of data. Complex data becomes intuitively understandable when we visualize it properly. Our brains evolved and are trained to recognize patterns—one of the key reasons why maps are so successful in communicating complex scenarios. GIS is the perfect toolset to visualize business complexity using advanced mapping and to provide analysis tools to help us understand risk and supply chain efficiency. 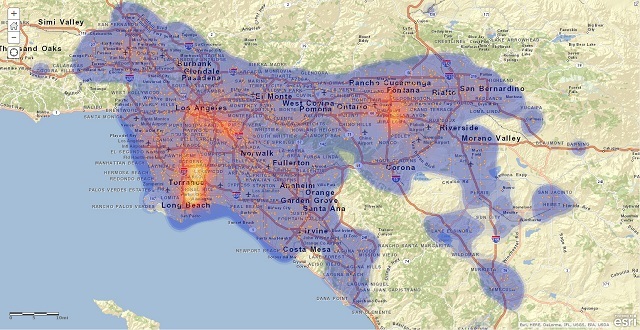 Esri is teaming up with industry experts and academics to help identify needs, discuss potential research, and engage in the needs of supply chain organizations in the Southern California area. We are working together to address how to run such a complex network of production, storage, and transportation as efficiently as possible. There are a myriad of ways that GIS helps maintain a sustainable supply chain. We can’t afford not to use the tools we have available to make a difference in our world.